Melt in your mouth soft cake-like Pumpkin Cookies bursting with tons of Fall flavor and smothered with heavenly silky Cinnamon Cream Cheese Frosting! These Pumpkin Cookies are a family favorite and will be the it of all your holiday and Halloween parties! 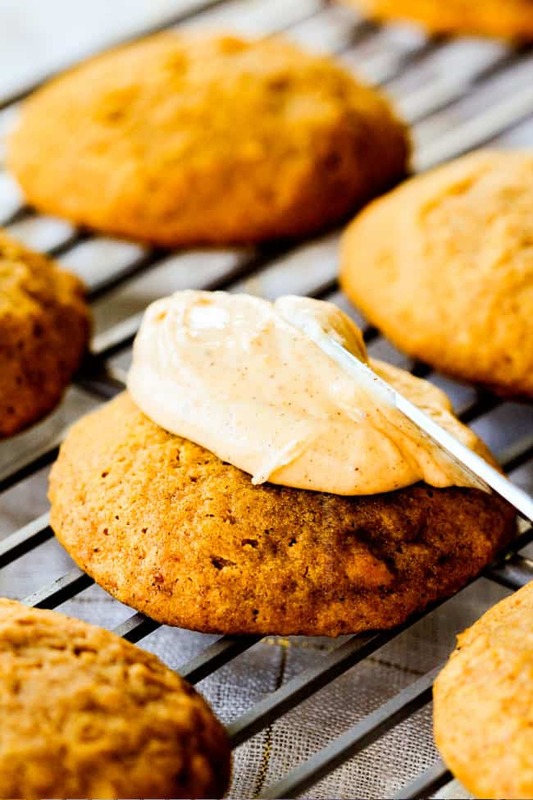 They are mega soft, easy to make and loaded with more pumpkin goodness than your average pumpkin cookie. These Pumpkin Cookies are choose your own adventure and can be made with just chocolate chips, just frosting or chocolate chips and frosting! Can you believe its pumpkin season?! Last year I stocked up on pumpkin so I could make pumpkin everything in the summer to test recipes for the blog but most of all because, well, pumpkin – I love everything pumpkin! If you have a pumpkin loving heart like me, then be sure to check out my other pumpkin recipes, especially Mom’s Famous Chocolate Chip Pumpkin Bread, Double Layer Pumpkin Oreo Cheesecake (with Video! ), Chocolate Chip Pumpkin Pound Cake, (Nutella) Pumpkin Crepes, Pumpkin Dip and Pumpkin Bars with Nutella Cream Cheese Frosting (see more Fall/Thanksgiving recipes HERE). And now my latest obsession, these Pumpkin Cookies! Seriously the perfect Fall dessert recipe that’s easy, make ahead, finger food and absolutely can’t-stop-inhaling-delicious. In fact, I dropped these cookies off to a neighbor friend of mine and she texted me a photo of her three adorable boys mid bite with three thumbs up and the caption, “They approve!!! Thumbs up and an empty plate…” And of course they talk about the “best” Pumpkin Cookies with Cream Cheese Frosting every time I see them. The have great taste. In researching pumpkin recipes to create my own version, they are all almost exactly the same so I started with the version I see everywhere but it was bland and not nearly pumpkiny enough. You might have noticed all of my aforementioned pumpkin dessert recipes are paired with chocolate in some form because Pumpkin + Chocolate = heaven and these Pumpkin Cookies are no exception. 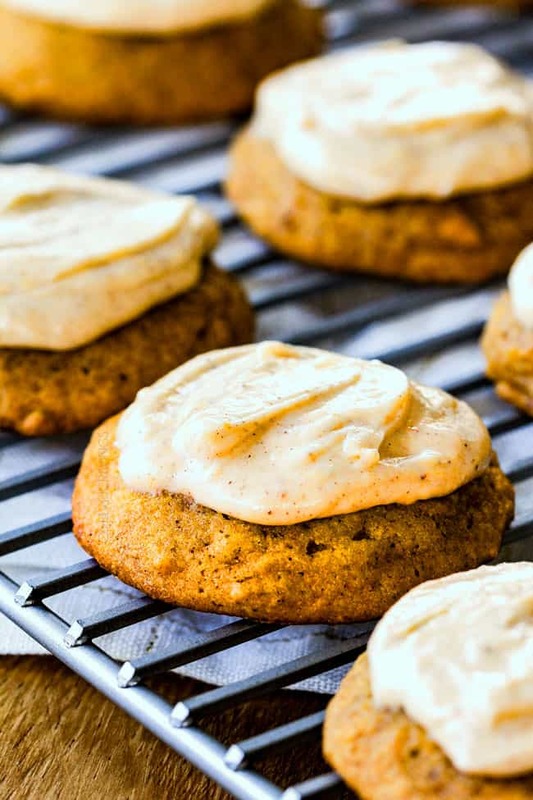 So if you don’t have all the ingredients for the Cinnamon Cream Cheese Frosting or don’t have time or patience to wait for these pumpkin cookies to cool to frost them so you can inhale them, then try adding chocolate chips instead, but just promise me you’ll try the amazing Cinnamon Cream Cheese Frosting one of these days? mmmm, k? So basically these cookies are two recipes in one. Can’t wait to hear which one you like best! In my personal opinion, the Cinnamon Cream Cheese Frosting takes these cookies to a whole new level. 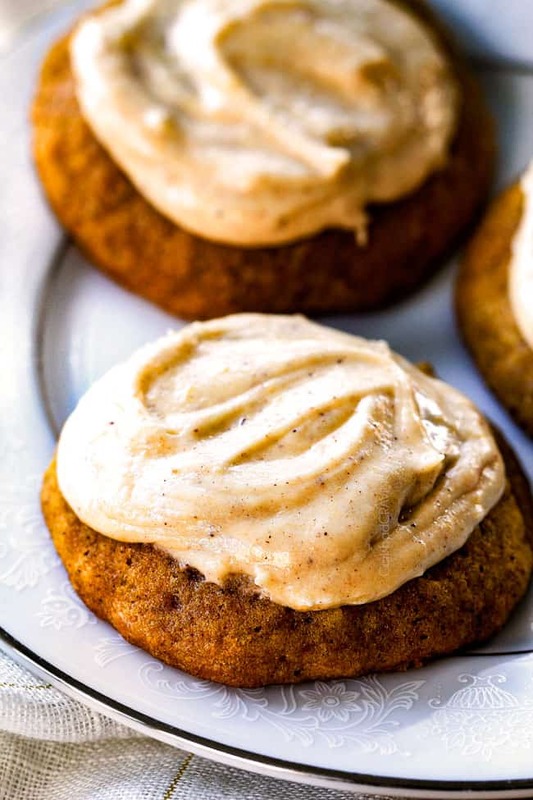 Its gloriously silky and boasts all our warm Fall spices because we first make a Spice Mix then add 1 teaspoon to our Frosting to make tangy spiced Cream Cheese Frosting for the perfect accompaniment to the perfect Pumpkin Cookies. How Do I Store Pumpkin Cookies? Pumpkin Cookies without Frosting: can be stored in a airtight container at room temperature for up to 7 days (if they last that long!). 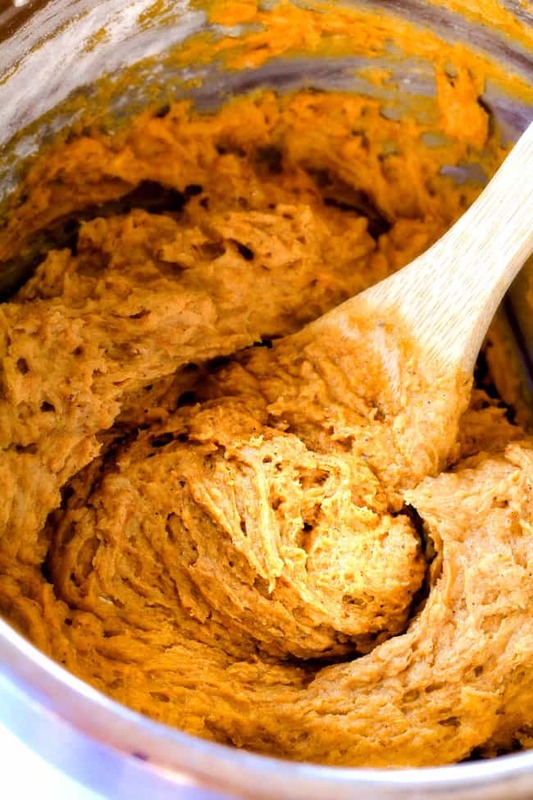 Pumpkin Cookies with Frosting: should be stored in an airtight container in a single layer in the refrigerator. Let sit at room temperature before serving or microwave for a few seconds (they are so much better warmed!). CAN PUMPKIN COOKIES BE FROZEN? Roll balls per instructions and fit as many as you can on a parchment/nonstick lined baking sheet without touching. Place the baking sheet in the freezer and freeze the balls until outsides are hard (about 1-2 hours). Transfer to a freezer size plastic bag and freeze. Cookie dough should freeze well for up to 3 months. To BAKE: Place frozen cookie dough balls on a lined baking sheet and bake according to instructions, adding a couple extra minutes to cook time. Fit as many COOLED baked Pumpkin Cookies on a parchment/nonstick mat lined baking sheet without touching. Place the baking sheet(s) in the freezer and freeze until solid (about 1 hour). 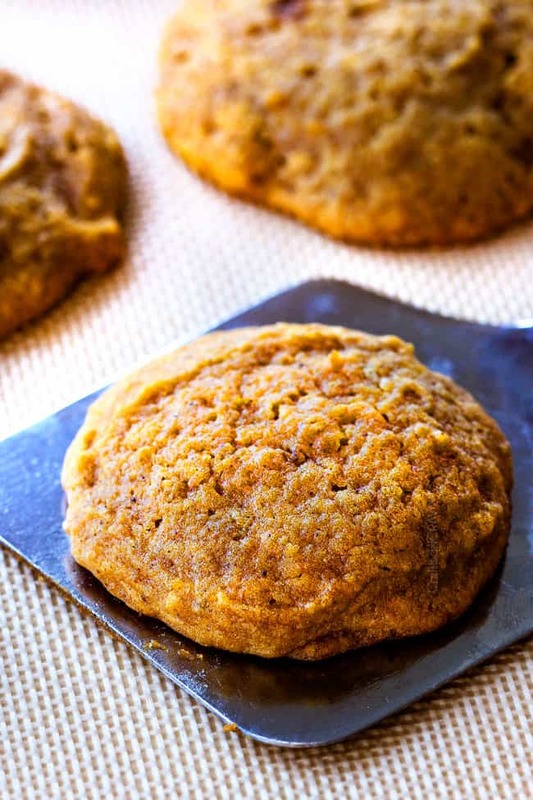 To EAT: When you want to enjoy a Pumpkin Cookie, take it out and let it sit at room temperature, warm in the microwave at 10 second intervals or warm it in the oven for a few minutes. Fit as many baked Pumpkin Cookies on a parchment/nonstick mat lined baking sheet without touching. Top frozen cookies on baking sheet with a layer of parchment paper and layer with another layer of frozen cookies (that you have frozen on a separate sheet). Continue to layer and stack as needed. Wrap entire baking sheet securely in layers of plastic wrap. To THAW TRAY: Take cookie tray out of refrigerator and unwrap so that the condensation doesn’t form and make them soggy. Let sit at room temperature for several hours. TO THAW INDIVIDUAL COOKIE: Take cookie out of the sandwich bag and let sit at room temperature, warm in the microwave at 10 second intervals or warm it in the oven for a few minutes. 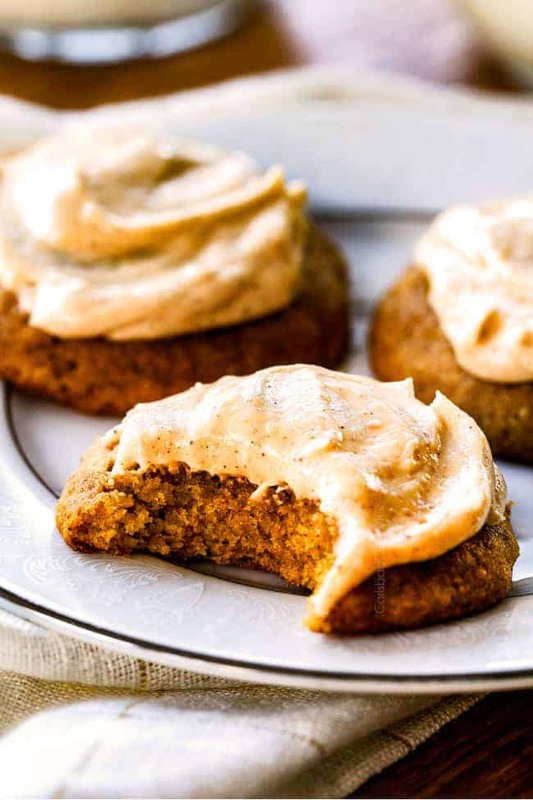 Want to try these Pumpkin Cookies with Cinnamon Cream Cheese Glaze? 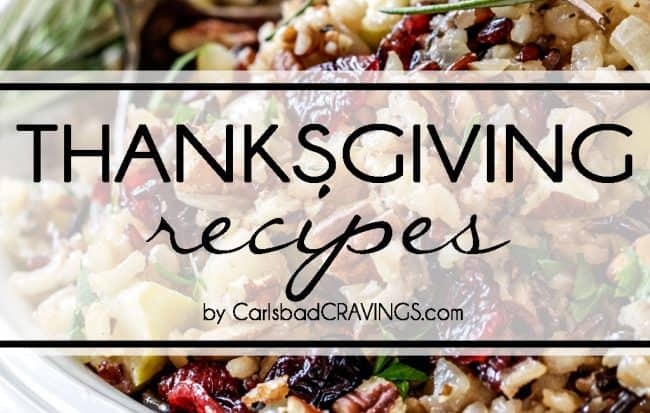 Pin it to your Dessert, Cookies, Thanksgiving or Fall Board to SAVE for later! Melt in your mouth soft cake-like Pumpkin Cookies bursting with tons of Fall flavor and smothered with heavenly silky Cinnamon Cream Cheese Frosting! Bring these cookies to your Halloween parties and they will be the hit of the night! Preheat oven to 350 degrees F. Line baking sheets with parchment paper or nonstick liner. In a large bowl, whisk together the Spice Mix ingredients. Remove one teaspoon to use in the frosting. To the remaining Spice Mix, whisk in all of the Dry ingredients. In a separate large bowl, beat butter with an electric mixer on medium speed for 30 seconds. Add sugars and beat until light and fluffy, 2-3 minutes. Beat in remaining Wet Ingredients until combined. Stir in Dry ingredients just until combined – don’t overmix! Drop dough by the tablespoon at least 3 inches apart on prepared ungreased baking sheets (you will need to use a cookie scoop as dough is very wet/sticky). Bake 12-15 minutes or until tops are set. Let cool for 3 minutes then transfer cookies to a wire rack to cool completely before frosting. Add vanilla ad reserved 1 teaspoon Spice Mix and beat to combine. Add milk, if needed, a teaspoon at a time to reach desired consistency. Evenly spread frosting on cooled cookies. I LOVE to microwave these cookies for 5-10 seconds after frosted for melt in your mouth deliciousness! *Do NOT microwave butter or your cookies will be too soft and spread when baked. Let butter soften at room temperature. **Do NOT microwave butter or cream cheese to soften for frosting or it will be too runny. Let soften at room temperature. ***This cookie recipe also is fabulous for Chocolate Chip Pumpkin Cookies. Add 2 - 2 1/2 cups semi-sweet chocolate chips after you add your Dry Ingredients to your Wet Ingredients and stir just until combined. To THAW TRAY: Take cookie tray out of refrigerator and unwrap so that the condensation doesn't form and make them soggy. Let sit at room temperature for several hours. Hi Annette. yes you can definitely freeze these – even completely frosted! Freeze them in a single layer on a parchment lined baking sheet then, once frozen, you can layer them in a tin with parchment paper between the layers. These cookies are DELICIOUS! I’ve made them twice now and they are amazing! 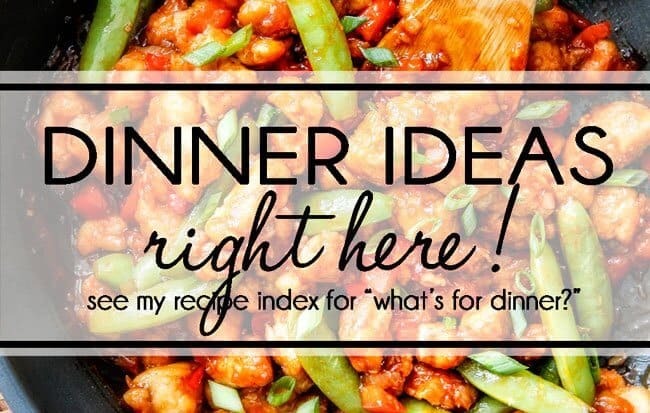 Thank you for the awesome recipe! These are sooo good! I didn’t add the clove because I’m not a huge fan but still delish! How do you store them? I’m lost on how to store baked goods with really cream cheese frosting.. do they need to be refrigerated? Hi Corrie, I’m so happy you love them! As far as storing goes, there are definitely different schools of thought when it comes to cream cheese, but I always store mine in the refrigerator. You can bring them to room temperature before eating/serving or microwave for a few seconds (my fav!). Could you clarify the measurement of cinnamon in the frosting ingredients? It has the measurement for the spice mix. The recipe sounds delicious. Thank you. Hi Jane, the frosting has just 1 teaspoon of Reserved Spice Mix for the frosting – the majority of that spice is cinnamon. Hope that helps! I can’t wait to bake these tomorrow. However, I ran out of parchment and too lazy to run to the store. Can i just bake these on the cookie sheet? Should i spray it? Thanks. I’m obsessed with anything pumpkin. Hi Laura, you can definitely bake directly on a greased cookie sheet. The cookies might spread a little more but they will be delicious! Your frosting recipe calls for 1 tsp of the reserved spice mix plus more cinnamon but you don’t say how much more to add. You also note that in your blog about adding additional cinnamon to the frosting. How much more should I add? Hi Barbara, I changed the recipe to make the additional cinnamon optional so just add to taste. Enjoy! I love how you can predict the questions I didn’t even know I was going to have! Love all the details and tips in your instructions. Ah, thanks so much Jenna, I am trying! I hope you love these pumpkin cookies as much as us!